Secure Delete: what is it, and do I need it? Secure Delete is a way to make sure that when you delete a file it cannot be recovered. Understanding Secure Delete is important to protect sensitive data properly. Although there are many software utilities that claim to be able to delete data files from hard drives securely and thoroughly, can't you accomplish the same thing simply by overwriting sensitive files with large, non-sensitive ones? To be honest, it depends on your level of paranoia. I suppose that also depend on the level of sensitivity of your data. But you are correct in the implication that a plain old "delete" isn't nearly enough. Let's look at that, and how far you might need to go. As you may already know, deleting a file in Windows doesn't actually delete the data. In fact, it doesn't really even delete the file - in Windows Explorer if you delete a file it just gets moved to the recycle bin. The file's not really deleted until the recycle bin gets too full, or until you empty it yourself. Naturally it's trivial to go digging around in the recycle bin to see what's been "deleted", and recover it intact. "Because of the way magnetic material on hard disks works, it might be possible to actually recover data that has been overwritten." Even a "permanent" delete after, or bypassing, the recycle bin doesn't really delete the data. In a sense, it just tells Windows "This space over here where there used to be a file? You can put something else there, if you like." It's kind of like moving out of an apartment by only taking your name off of the door. Until someone moves in and replaces with their own, all your stuff is still inside and available to anyone who knows how to look for it. That's where the concept of "secure delete" comes in. A secure delete overwrites the data in the file when the file is deleted. This takes longer, of course, as it has to actually go access the entire file, but it ensure that the data is no longer accessible to the casual observer. It's kind of like making sure your apartment is empty - or at least full of stuff that isn't yours - before leave. Unfortunately simply overwriting one file with another does not do this. The problem is that you can't control where the operating system is going to write the data. Depending on how the copy is implemented it may copy the data to a new file on the hard disk, delete your old file, and then rename the new file to the old file. (A very common technique.) Note the "delete" in the middle - that's not a secure delete. Your data is still out on the hard disk. The bottom line is that, yes, a secure delete utility is probably what you need. It will ensure that the actual sectors on the hard disk that your file occupied are overwritten with other data. Our friends over at SysInternals have such a utility for free: SDelete. Alternately, there are also "free space wipers" that will simply write data to all the free space on your hard drive. This removes the data from any and all files that have been permanently deleted. As it turns out, SDelete will do this as well. Now, there's one more step we need to look at before we say we're done, and this is where your level of paranoia, and the sensitivity of the data, come into play. Because of the way magnetic material on hard disks works, it might be possible to actually recover data that has been overwritten. It's most definitely not trivial, and often requires special tools and techniques (and often a fair amount of money), but it sometimes can be done. The solution is to ensure that the secure delete utility has the option to overwrite the data multiple times. (It can actually involve much more than that, based on things like physical disk configuration and disk head movement.) By writing over those soon-to-be-free sectors multiple times, the original data is well and truly gone. A version of this article that can be republished without cost is available at ArticlesByLeo.com terms). I deleted a file by mistake - can I get it back? It is sometimes possible to recover an file deleted by accident. Stop using the disk, check your recycle bin, and perhaps pull out an undelete utility. Why can't I delete this file? Sometimes a file cannot be deleted because it has invalid characters in its filename. There are techniques and tools to force the delete anyway. and it will also overwrite all unused disk space, it is worth checking out and it's freeware. I'sorry i don't need what i wanted no more. Please, does secure delete work with xp windows? Do you have a BAT file that will automatically start sdelete? If not can you explain more about how to set up sdelete, select the various option? SDelete's options are covered quite well on it's download page. We let go an employee wholived out of state. We asked him to return his laptop. All the company email he had on his coputer he had delteted, and we can't seem to retrive it or recover it. How much does it cost for someone who really knows Windowsxp professional & Outloook to try & recover? I understand it may not work. His provider for internet was AT&T. Isn't it against the law to on purpose delete company imformation? well I have downloaded it, unzipped it but still have no idea how to make it work. All I get is an icon which doesn't open or apparently do anything. a) it's a program you run in a windows command shell, and b) the usage instructions are on the page you downloaded it from. I want a secure delete application that integrates into the recycle bin, such that any time a true file delete operation is emitted the secure deletion utility is used to shred the file content on disk. Know of anything like that? File under: don't make me think; help me do what I need done. 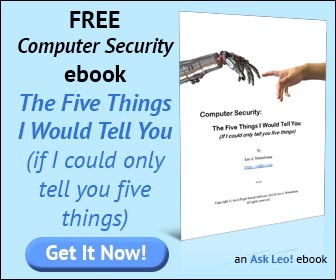 Leo, I am not paranoid about what is on my computer, I am just scared all that stuff is slowing the computer down and filling it up. we show and breed Shar-Pei. I can hear again from someone who bought a puppy 8-10 years ago, put their name in Search, and pull up 7 copies of every email they sent me and I sent them. And they weren't anywhere I could find them. My computer blew in 2005, and March 2008, and we got a new one each time, with the geeks transferring as much as they could. Does sdelete work with Vista? Thanks. I use a free program called Eraser. It will securely wipe the free space on your media or a single file or folder or mulitple files/folders. Plus it has a shell context menu. So you can right click on the file or folder and erase it. It also has a scheduling feature. You can choose your erase method from 1 pass to 35 passes or create your own method. It works on XP and Vista and comes in a 32 bit or 64 bit version. Acronis True Imgage Home also alows you to securly "wipe" your files. I have one question though. Generally speaking which erase method should a person use? There are so many out there from the US DOD 7 pass to Gutman's 35 passes. Which would be the best one to use? Thanks in advance to everyone who answers the question. To everyone that requires secure delete use a much better software as KILLDISK or Erasedisk to achieve the results you want. i'll try to overwritten data several times to hdd.. but it take long time to complete.. do u have any suggestion how I can shred hdd quickly but securely?.. Use Ccleaner they have a wipe free space function now! And if you really want to git rid of everything from your hard drive simply do an MBS format!!! "master boot sector" I use Super F Disk Bootable CD.. Should be easy enough for those to find who are in need of this CD. Download it "for free" and burn it to a CD.... Its really simple! Does defragging help, or do those deleted files still sit out there somewhere? Yes and no. Defragging can make it more difficult to recover deleted files, but it's not guaranteed to do so by any means. If you need to securely delete, then use some kind of secure delete utility. Well if they're banging down your door and you're an Israeli spy in Iran, chuck the hard drive in the microwave and turn it on high for as long as possible. If you have time, unscrew all the fittings and get as close to the platen as possible and just put the recordable surface in the microwave. If the microwave eventually spontaneously combusts, then I suggest your data is probably unrecoverable as required. Mission accomplished? can you tell me if REVO is any good for wipeing files from computer. Wouldn't it be easier to encrypt the file first, then delete? No. I don't see how that would help anything - unencrypted but deleted copies may still be on the hard disk - perhaps even the result of the encryption process itself. -Spybot Search and Destroy has a Secure Shredder tool that can be set to as many as 35 passes. -CCleaner has a Wipe Free Space option. -System Mechanic includes an Incinerator that can be configured to use DOD 5220.22M. -Malwarebytes Anti-Malware includes a FileASSASSIN tool that can delete locked files. 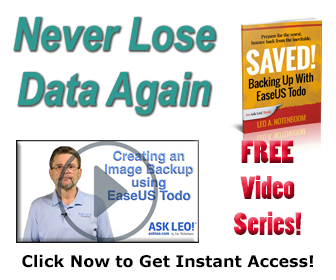 Before deleting file data are overwritten by zero bytes to prevent recovery of deleted files." -See the Wikipedia article "Data remanence". My computer was wiped clean of XP and set back up with Win7. Can I assume that everything from the past was completely deleted? I can't say without knowing exactly what was done. Short answer would apparently be: no, you can't assume. Can I go into the history, even though it has been deleted, and find out what the history on the computer was? ComputerWorld reports (March 7, 2011) that recovering data from both SSD drives and flash drives is incredibly easy even after being overwritten. This article requires you to sign up. But it is harmless to do so. Remove the check marks from both boxes and you will not get any additional mailings. At least that is my experience. This article is scary and should be required reading. The secure delete utility by Sysinternals, mentioned in the article, will do the job. It is a Microsoft program. Why doesn't MS include it in Windows is anybody's guess.